Our Full Color Custom Game Tokens feature any designs you choose digitally printed on both sides of the Game Tokens. 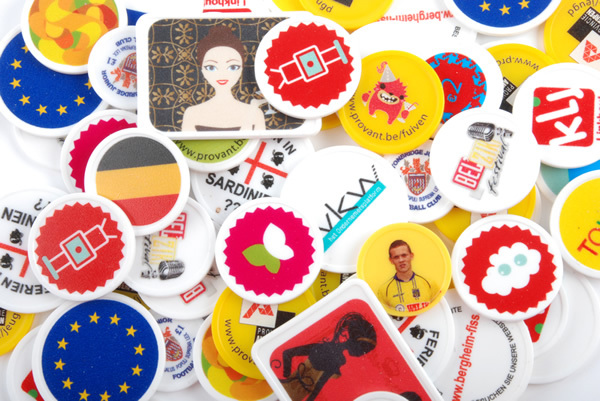 Your full color design is printed on white or colored plastic tokens. Our special digital printing method produces detail-rich, quality images for your tokens. White and Colored Full Color Plastic Game Tokens are available in 15/16", 1", 1-1/8", and 1-3/8" round sizes (all 1/12" thick), as well as a rectangle shape. The following Full Color Game Token colors are available: Black, Dark Blue, Light Blue, Dark Green, Light Green, Gold, Orange, Day Glow Pink, Purple, Red, Turquoise, White, and Yellow. The minimum order for Full Color Customized Game Tokens is only 1,000 pieces. Production time is about three weeks after proof approval.